Hi everyone! Here we go again! Now remember I told you last week that that was the last time my spring dishes would be out? Well, they are gone! Rotated up to the top shelf of the kitchen cabinets and down to the middle shelf came the summer ones. And I love these just as much. The vintage blue and yellow tablecloth is one from my childhood. The pattern is by Nikko. It is called Pleasantdale. golly . . . it's been about 12 or 13 years now. A friend of mine gave me a pair each Christmas. I now have a collection of 12. Ok! Now lets get real! It all got put back in the cupboard. and the centerpiece and linens back to the closet. Because during the summer - I declutter the entire house. I just don't have too much stuff sitting out. Dining room is very minimal. I do my best to not heat the oven. Period. We'll do all of our BBQ and cooking outside on the grill. to spend my time dusting all of my pretty things every other day. Usually, this is what the kitchen table looks like! Grab the napkins, the wine and glasses, and minimal dishes . . . Cause we usually eat out here! But I guess that's another post! I appreciate your honesty. The same goes at our house, too! Love your summer dishes. I love blue anything! And the napkin rings -- I have silver ones as well and absolutely love them -- every meal our napkins are in them. What a great pattern on those dishes! I really like them. But!!! I'm really liking those napkin rings. Napkin rings are a weakness of mine. I have to laugh as my house usually does not look like any of these tablescapes during the work week either. I do like your Nikko dishes. Oh, this is funny! I love your outdoor table and think your idea of putting things away to make life easier is a good thing! Now those dishes are so lovely! love the blue and yellow. I like the blue and yellow combination! Great! I didn't even know Brighton DID napkin rings...! Thanks for keeping it real. I love, love, love the napkin rings. Great tablescape. Love those dishes too! Makes me want to go shopping:) Have a blessed day! Love what you did ! I didn't know that Brighton made napkin rings...I heart Brighton ! You have a very nice collection ! I love the blue and yellow combination. Isn't it so dreamy? Thanks for sharing. 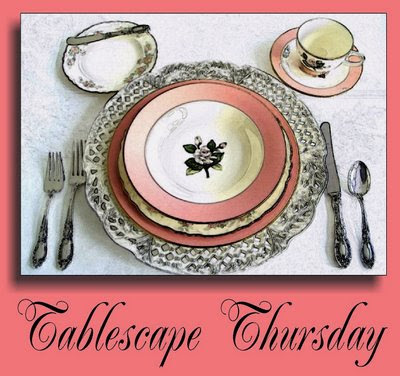 Stop by and see my table setting, if you like what you see, be sure to subscribe to my blog by clicking on "Follow" in the right hand column. This way we can inspire one another frequently! Be sure to stay a while when you're there and enjoy the experience! How pretty! I LOVE the napkin ring! Everything looks great! So pretty - and I even liked the "reality" table! Karen you are too funny!!! I like your blue dishes, but I am with you, less is better during the summer. With that beautiful yard, I would eat out there too. Thanks for sharing that. I enjoy seeing other peoples hard work (o: My youngest son turns 24 in June. Fun to see the pics of your son. Love the blue and yellow together. I did a guest bedroom in those colors. I'm with you, I have a kitchen because it came with the house. lol Not really. We use it occasionaly. I love eating out when the weather permits. Now I like an honest woman! I love that vintage table cloth, though. And those dishes! OMG! I love those dishes. But you can't beat outside, can ya? I love your summer dishes!!! The colors are wonderful and perfect for summer!!! My husband and I ate breakfast outside this morning and like you that is where we will have our meals until it gets too hot to breathe...summer in Texas!!! Thank you so much for stopping by earlier!!! I appreciate your prayers. It is not looking good for this precious lamb. I feel so for his family!!! Thanks again!!! Have a wonderful Memorial Day weekend!!! OH how I love dishes..and yours are just gorgeous! I have NEVER seen that pattern before..and the color is rather unusual. SO pretty! The napkin rings are beautiful too. WHY aren't I over here checking on you more often!!! I'm MISSING out!! I tell you, I am running as fast as I can...not wanting to miss a thing..and still I miss stuff. Thanks for stopping by!